On Oct. 5, Conservancy Preservation Programs Manager John Waters met at the Pope-Leighey House in Mount Vernon, Virginia, with conservators Pamela Kirschner and Andrew Fearon, National Trust Graham Gund Architect for historic sites Ashley Wilson, and Pope-Leighey representative Peter Christensen. The focus of the discussion was the conservation of the exterior wood at this important Wright-designed public site. Fearon and Kirschner have done extensive work with the conservation of 20th-century wood and have developed a finish protocol that has been used on Pope-Leighey, as well as several Louis Kahn houses in the Philadelphia area. Kirschner is a past board member of the Conservancy and a frequent attendee of Conservancy conferences. In contrast to the common practice of using surface-applied protective coatings such as Sikkens and polyurethanes, the process Kirschner and Fearon have developed relies on a thorough cleaning of the wood, then a finish that soaks into the wood. The critical difference in their process is that the potentially destructive removal of the earlier finish does not need to occur in subsequent re-applications. Fearon likened the reapplication of surface-applied finishes as being like the refinishing of a wood floor. The removal of past applications can only occur so many times before the wood floor essentially disappears. This is a fairly major shift in wood conservation and protection models and could have important implications for the long-term care of Wright’s work. They have developed a process that can be used by building owners that is outlined on our building owner resources page. It is also discussed briefly in this National Trust article. On the same trip, Waters and Conservancy board member, architect and Sweeton House owner Dan Nichols met with the owners and restoration architects of the Euchtman House in Baltimore. The owners have consulted with TarantinoStudio and are working with Baltimore architects Ziger/Snead on restoration work at the house. Waters and Nichols also made an easement-monitoring visit to the Elizabeth and Robert Llewellyn Wright House in Bethesda, Maryland, and enjoyed an informative meeting with owners Tom and Etsuko Wright. In 1999 the Wright family generously donated a preservation easement on the house to ensure its preservation. As a part of its responsibility as the holder of the easement, the Conservancy periodically visits easement sites to confirm that the sites are maintained according to the easement agreement. As expected, all was well at the Wright house! Find more information on easements here. The Clifton and George Lewis House, Spring House, came through Hurricane Michael in October with only minor damage that was quickly addressed. Tree limbs had fallen on the roof creating small punctures. These limbs have been removed and the roof repaired. See Spring House’s Facebook page for more. Annunciation Greek Orthodox Church was notified in October that they have been accepted into the National Fund for Sacred Places program, run through Partners for Sacred Places. This program will provide donor capacity building and grant money for restoration work. The church will soon announce their selection of a preservation architect who will work with them to provide a road map for future restoration. Prospective preservation-minded buyers are invited by the Tiernan Group, realtors for the Booth Cottage, to a private reception at the cottage, in Glencoe, Illinois, on Sunday, Nov. 11, from 1-3 p.m. 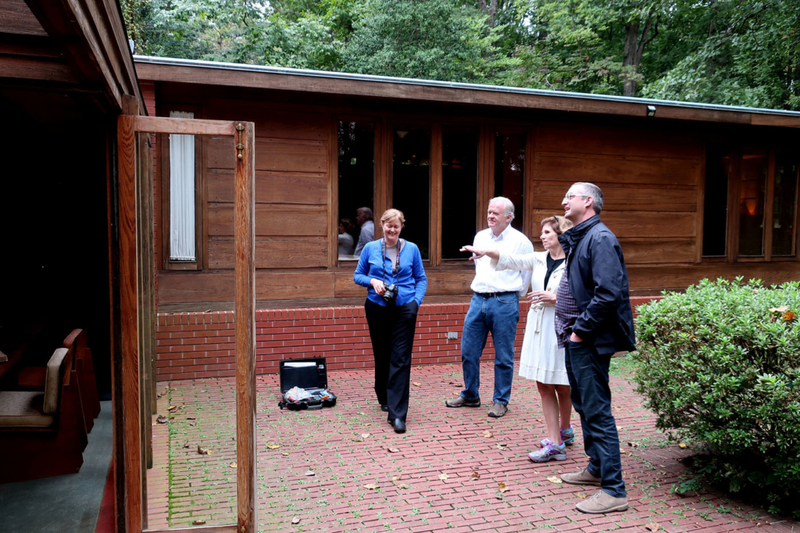 The reception is an opportunity for potential buyers to envision the future of this unusual Wright design that pre-dates much of Wright’s work on low-cost housing, particularly the Usonian house. Attendance for the reception will be limited to the first 50 people and is only open to serious buyers. RSVP is required. Built as a temporary home for the Sherman Booth family while their larger Wright-designed home was being built nearby, the cottage was moved in the late 1910s to its current location. This site is adjacent to the Ravine Bluffs neighborhood in the North Shore Chicago suburb of Glencoe, where several other Wright-designed structures are located. The family who has lived there for 60 years recently relisted this 1,700-square-foot house for $825,000. The Conservancy has been working on the future of the Booth Cottage since last fall when it went on the market. Realizing that this building sits in the middle of a tear-down neighborhood with much larger houses surrounding it, we have been working to ensure that the home finds a new preservation-minded owner. 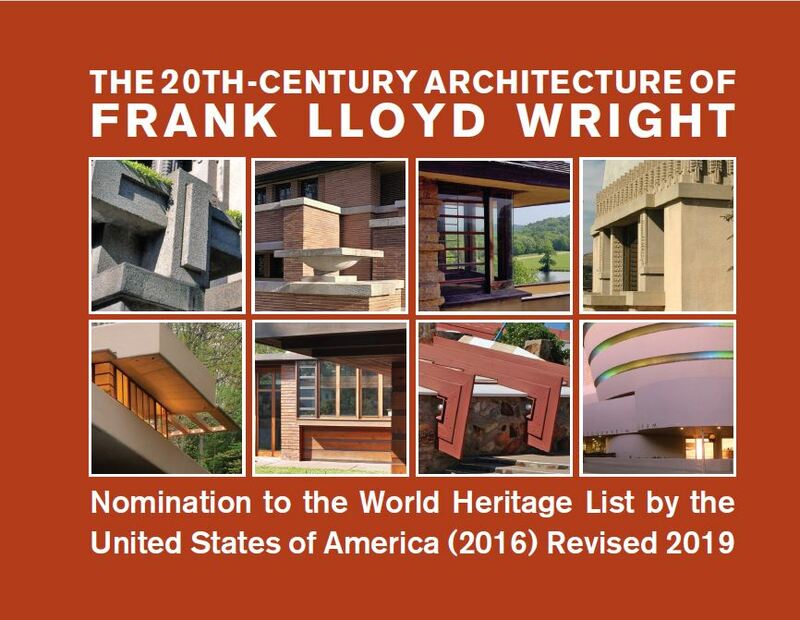 The Conservancy has been working throughout the past year with the National Park Service and representatives of the Frank Lloyd Wright World Heritage Council to revise our 2015 nomination to the UNESCO World Heritage List to address comments on the initial draft of the nomination by international reviewers. At the end of September, the nomination writing team completed revisions to all of the nomination’s components and sent it for review by the National Park Service for additional analysis and comment. After a final review in October, the Conservancy will submit the nomination package to the World Heritage Centre before Thanksgiving for consideration at the World Heritage Committee’s summer 2019 meeting in Baku, Azerbaijan. Conservancy representatives have regularly visited the new site of the Lindholm House and report that construction is proceeding and that the quality of work is excellent. Construction is expected to finish in late fall with an opening for this new public site in spring 2019. The previous owners, who are descendants of the original owners, have donated much of the original furniture to the site at Polymath Park in Acme, Pennsylvania. When construction is complete, a preservation easement, administered by the Conservancy, will be placed on the house and furniture protecting them in perpetuity. The fall 2018 issue of SaveWright magazine includes an article on the Lindholm House. As the Conservancy reported in September, the David and Gladys Wright House, recognized by scholars as one of Wright’s most important works, was listed for sale on Sept. 1. Located in Phoenix’s Arcadia neighborhood, the 5.58-acre property’s $12.95 million listing makes it one of the highest priced pieces of real estate in the state of Arizona. The Conservancy’s involvement began in May 2012, when we were notified by a preservation-minded local realtor that the house was under contract, and the new owner planned to demolish it and subdivide the property in order to build two large residences. An intensive multi-year effort to save the home began, and the Conservancy brought several buyers to the table until one offer, from a young attorney who grew up in the neighborhood, was accepted in December 2012. He paid $2.38M for the house on 2.4 acres. Over time, the owner acquired acreage around the home and cleared the buildings to make way for a Wright museum and visitors center. When his plans for a public site and education center did not materialize, he announced in June 2017 that he would donate the home to the School of Architecture at Taliesin, contingent on the school’s ability to raise $7 million for restoration and operating endowment. This summer it was announced that the partnership with the School would not move forward. As these events were unfolding, the Conservancy reached out to the owner and local allies. We knew that putting the home on the market was a likely possibility, and indeed on Sept. 1 it was listed. A landmark application is pending for the 5.58-acre site, but this could be withdrawn by the current or a new owner at any time, effectively leaving the property without protection. The house sits in the middle of a purely residential neighborhood that continues to transform with new development. While we work with our network to reach potential preservation-minded buyers, the challenge now is not finding a $2.5 million buyer as in 2012, but a $13 million buyer, with the ability to invest an additional $1 million to $3 million in suggested restoration costs. Unless a preservation-minded buyer comes forward who can meet the seller’s asking price and finalize the application for landmark designation, or donate a preservation easement, this important Wright-designed house is a prime candidate for being torn down so the valuable land can be redeveloped into multiple new-construction homes. 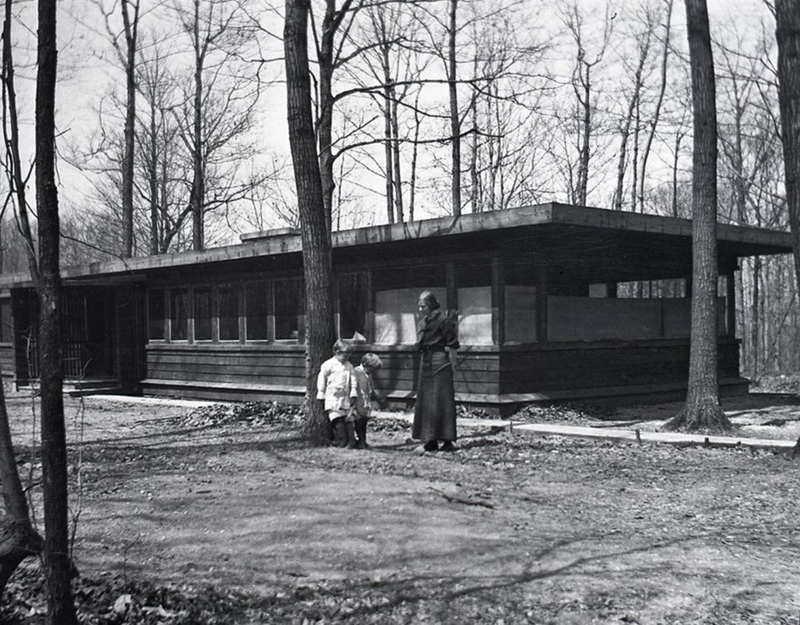 The destruction of the David and Gladys Wright House would result in an irreversible and devastating loss to the canon of American architecture—comparable to the demolition in 1950 of Wright’s groundbreaking Larkin Building. We are asking our constituency for assistance in helping to draw attention to the urgency of the situation. Serious purchase inquiries can be directed to bgordon[at]savewright.org.